It can sometimes be much more convenient to have an existing door hanging on the other side of the door frame than you currently have it. 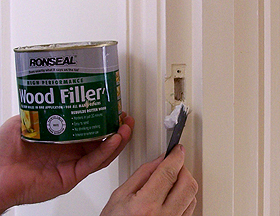 This works best on painted door and door frames as you can paint over afterwards. 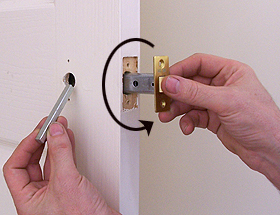 Spin the door horizontally through 180 degrees so that the existing door handle is on the new opening side. You need to take out the latch and rotate that through 180 degrees. To do this you'll have to unscrew one of the handles and then remove the central spindle. Now you'll be able to unscrew the latch, rotate it and screw it back. Put back the spindle and handle as they were. N.B. the new hinge position on the door will be almost where the old ones were but on the other edge of the door. When you've got the new hinges on you have a small rebate to fill. Use method 1 or 2 above. 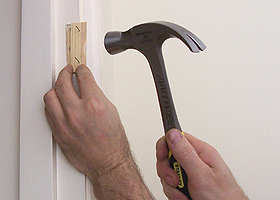 Re-fix the latch plate on the other side of the door frame(see fitting a door handle) and make good the old hole with some two part epoxy wood filler.